For years I was on a quest for the RFC 822 license plate. I looked in license plate shops in the US, I asked around on Internet, I searched websites. And now..
My quest has ended. 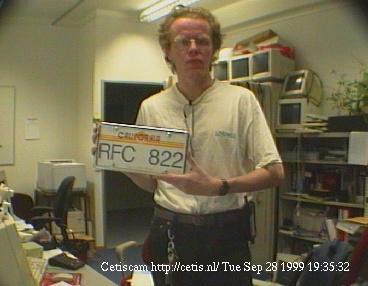 On September 27th 1999 I received a California license plate reading 'RFC 822'. I have been looking for this one for years, and a group of people have given me the plate for my 30th birthday. Thankyou. This is a bit of 'holy grail' for me since I am quite interested in how E-mail works.